I’ve been on a mission to fill in the gaps of my gaming knowledge. Critical darling and cult favorite PS2/XBox/PC action-adventure game Psychonauts is currently on my plate. I didn’t play it when it first came out in 2005 because I wasn’t as immersed in videogame culture and had no idea what the game was about. It looked weird. Not gonna lie. Psychonauts is weird. But it’s one of the most delightful varieties of weird I’ve ever played. Too bad the game’s mechanics–controls, combat, and camera–cause frustration to throw a moist (not full wet) blanket over my enthusiasm and enjoyment. 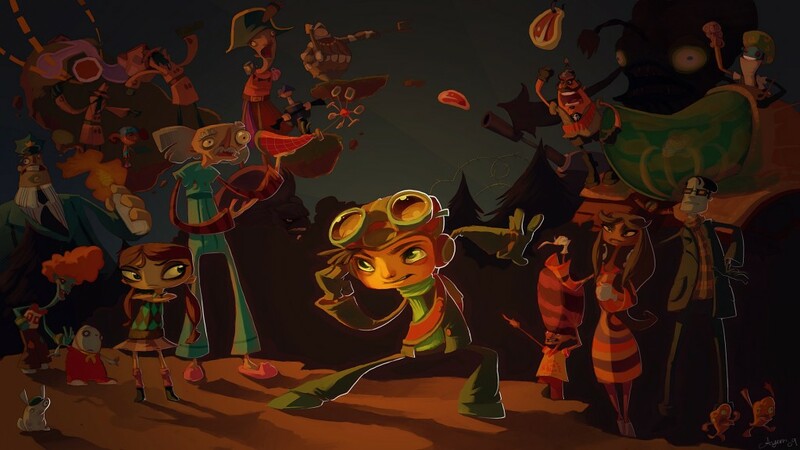 For those who’ve heard nothing about the game, Psychonauts, is a quirky (not really a fan of that word, but it fits here) action-adventure game about a summer camp…for psychics. Strap yourselves in. That’s just the beginning. Your character–Raz (short for Razputin)–has run away from the circus to attend Whispering Rock Psychic Summer Camp in order to train and become a Psychonaut–from what I’ve played so far, that’s some kind of government psychic secret agent/spy. I dig it. While undergoing his psychic training, Raz uncovers a sinister plot that appears to center around a strange dentist with a metal claw for an arm removing the brains of the camp-goers. He does this with some sort of pepper grinder that makes them sneeze out their brains. Gross (but quirky!). Psychonauts’s humor, dialogue, and writing are its strongest assets. The off-kilter nature of it all is supplemented by the wonderful visual aesthetic. Characters are supposedly human, but none of them share similar anatomies. Camp bully, Bobby Zilch, has blue skin, an incredibly long, slender neck, and a giant orange afro. On the other hand, main character Raz looks kind of like an ant with yellow skin. The color palette used for all the skin tones reminds me a lot of the cartoon Doug. The characters in that show were all blue, green, yellow, purple, etc. Anything that recalls Doug gets points in my book. However, Psychonauts falls apart a bit for me when it comes to the actual game mechanics. Jumping is floaty enough for an action platformer like this, but the camera angles and control sometimes make it hard to judge the distance of your jumps in 3D space. Combat is another weak spot, especially during boss encounters. One boss fight against a Psychoblaster Deathtank was particularly frustrating because you needed to hit it with a ranged attack only at a certain time. However, your attack can only go a certain distance. But the enemy tank has much greater range than you, and it has a dash attack that’s much faster than you. I spent most of my time trying to stay out of its range, while simultaneously targeting it with the game’s version of L2 targeting/lock-on. Again, the range for the targeting mechanic is much shorter than the boss’s range. The entire fight was an exercise in frustration. Sadly, other enemy encounters aren’t much better. The combat is where Double Fine’s lack of experience making this type of game really shows. It’s really sad because everything else about the game is just delightful, but I’ve gotten to the point where I don’t want to play it. If I could watch somebody else play the game so I could experience the humor and story, I’d be fine at this point. Okay, maybe that’s a bit of an exaggeration. I’ll finish the game, but from what I’ve played so far (about 6 hours), Psychonauts isn’t the perfect, quirky gem that it’s been hyped up to be. It’s got a lot of high points but also some deep lows.